This is a Pinocchio Snowglobe that I bought at Walt Disney World. 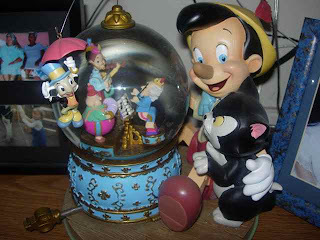 It features Pinocchio, Figaro the cat, and Jiminy Cricket, as they sit around listening to the wind-up music box play. This snowglobe actually has a wind-up music box built right into it- and the conductor inside moves back and forth as the music plays. The tune played is "Brahm's Waltz" This piece is incredibly detailed! Hello, you sell the music box? I would sell it for $200.00 plus shipping. Let me know!